How clean is the water we are drinking? Is bottled water really any better for us than tap water? How can I be sure that the water I am drinking and using in my home is safe? If it's not safe, what can I do to fix it? These are some of the questions that Dr. Moe Mukiibi is asking for us. 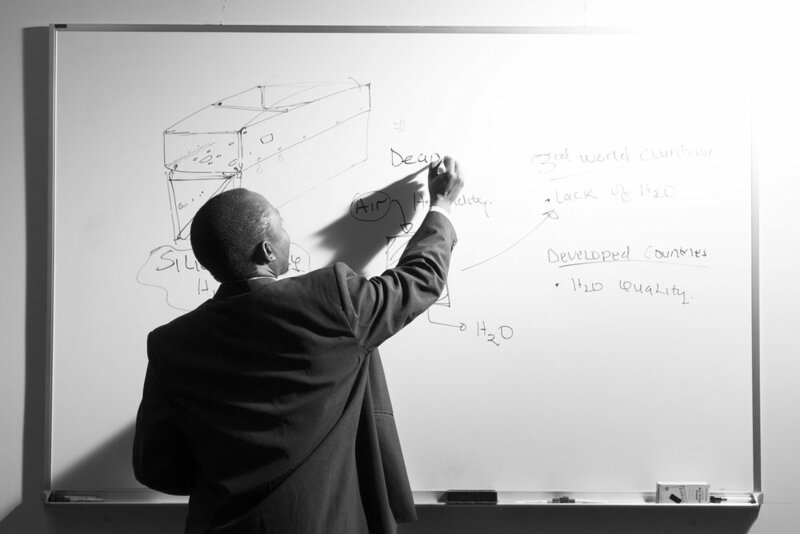 As a globally recognized Water Exert and Tech Innovator, Mukiibi has been all over the world trying to solve our water problems and wants to empower the average person by helping them understand what is in their own water. “We gotta do better, we gotta educate the people,” he proclaims. Since then, he received a PhD in Chemical and Environmental Engineering and has worked around the world with various water technology companies. 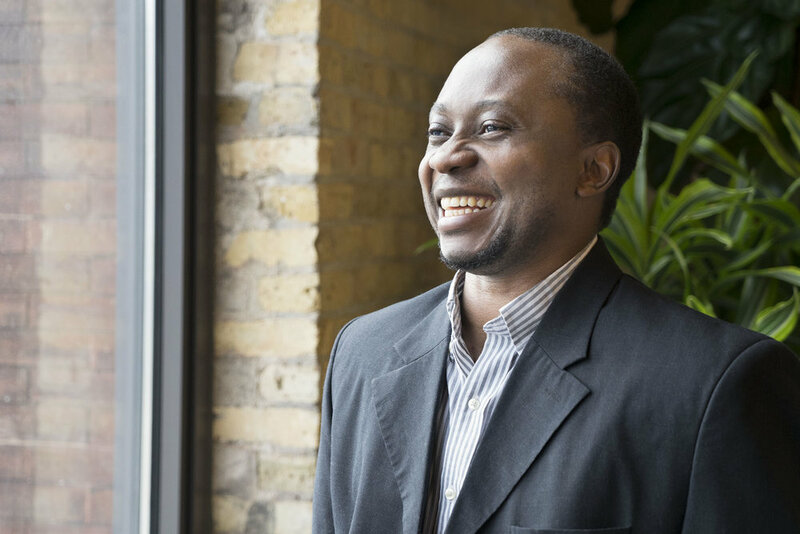 He now resides in Milwaukee working as the Executive Chief Technology Officer with Stonehouse Water Technologies at the Global Water Council. But for Dr. Mukiibi, that is not enough. He has 9 patents out for water technologies that he invented, including a machine that can convert air into water. Don't believe me? Ask him yourself. If people joined this co-op, he would teach them how to read the water report they receive in the mail every year, teach them how to test their own water and help them find a filtration system that matches their water supply quality and lifestyle. Dr. Mukiibi's idea is to first educate this group of people. Then once educated, these people can take this information and educate others, make money off their ideas or simply be safe in their own homes if that is what they desire. Jaime Hayden is an outgoing and engaging pilates instructor that runs a small studio in the Third Ward called Flying Squirrel Pilates. Jaime is a busy woman, teaching a wide variety of classes along with running the business on her own. She first became certified in pilates 12 years ago while working a surprising mix of other jobs. Originally from Houston Texas, Jaime moved to Milwaukee to be closer to family. She started her business seven years ago out of her home with a little support from her dad and it has been growing ever since. She now has bragging rights for winning the best Milwaukee pilates studio in 2013, 2014 and 2016 according to Milwaukee A List. When describing her path of how she got here, Jaime described her love of athletics and history as a softball player and gymnast. Later in life, she had two knee surgeries and consequently found pilates. She quickly fell in love with the new sport and pursued the idea as a career. Pilates was "designed to make your body feel good doing everything else you do," she explains. "It is meant to strengthen your core and keep your vertebrae decompressed." Jaime sees pilates not just as a sport, but as a healing practice. She began telling me about her very first client, Terri, who has taken her classes in every location she's taught for 7 years now. The two met at the occupational therapy clinic where Jamie was working at the time. Terri has severe rheumatoid arthritis and used to have a very limited range of motion, but has been taking Jaime's classes twice a week ever since she started the business. Now Terri "can do planks better than anyone. What it's done for her rheumatoid arthritis is amazing," says Jaime with a proud smile on her face. If you talk to Jaime for more than 30 seconds, you can tell that she is passionate about her business and her clients. "My clients are amazing, they've become super good friends," she mentions and adds that she would much rather be doing this than anything else. So talk to her yourself or better yet, take a pilates class. You can view her website at http://fspilates.wixsite.com/flyingsquirrel. One morning on my day off, I was wandering down Kinnickinnic Avenue just after grabbing a cup of coffee from Stone Creek. I figured I would check to see if there was anything new on the main street when I stumbled across Voyageur Book Shop, a hidden little book store at the end of the block with an impressive collection. I thought that surely I must have walked by this place a thousand times, but after walking in and talking to co-owner Blaine Wesselowski, I learned that he and Jeremy Mericle just opened the shop in spring of 2016. Blaine and Jeremy met while working at Renaissance Book Shop a few years back. Once the shop closed, they bought a large collection of the books and art (now hanging on Voyageur's walls) in order to open their own place. Blaine, originally from Kansas and Jeremy, originally from Wisconsin are a perfect match for going into business together. They both have a love for rare books and a knack for finding unique copies. So how does one acquire books to fill a small book store? Well, you have to do your homework. Blaine explains that it's about knowing the right type of places like certain estate sales or specific library sales. "Often you get referrals from people that have a library they want to sell out of" and those can be gold mines. But there's more to it than simply finding the books, you also have to know your customer base and carry the books that people will buy. Popular authors like Edgar Allen Poe always sell out. "The earlier in life people experience the author, the more broadly known they are," says Blaine. You might be wondering what book shop owners Blaine and Jeremy are currently reading so lucky enough, I thought to ask. Jeremy is deep into The Adventures of the Black Girl in Her Search for God by George Bernard Shaw while Blaine just finished a biography of Lewis Carroll and has now moved onto Mayflower by Nathaniel Philbrick. And yes, conversations with these two are as unique as their book choices. So take a stroll over Voyageur and venture through the boundless collection of stories. Three Sisters Community Farm is a young organic farm run by Kelly Kiefer and Jeff Schreiber. They recently started their farm in 2011 using Kelly's family land where she grew up and additional land nearby. The name Three Sisters is unique because it has two meanings: Kelly is one of three sisters and there is a group of three crops that support each other when grown together which native groups called the three sisters. These three crops are corn, beans and squash. The corn grows tall providing a trellis for the beans to climb while the beans create nitrogen rich soil, needed to make plants healthy. And finally the squash grows on a vine which provides ground cover for the soil around the other plants. "We liked the picture of this synergistic combination of plants contributing to the greater benefit of the whole system as a metaphor for how we build relationships with our community of supporters," mentioned Kelly. I recently visited their farm in the fall while they had volunteers helping plant garlic and prepping the tomato plants for spring. While having the privilege to speak with Kelly and Jeff, I was able to gain some insight on how much work they do both on and off the farm. Working on the land is not easy and farmers often spend 10 or more hours working on their land every day. But owning a farm also means owning a business. Winter is their opportunity to catch up on calculations for the season, taxes and all of the less glamorous pieces of running a business. Kelly and Jeff stay connected to their supporters in multiple ways including volunteer opportunities and Community Supported Agriculture (CSA). One of their goals is to build community relationships and create a welcoming sanctuary at their farm so if you are interested in volunteering, I hear they pay in vegetables. For those of you who don't know, becoming part of their CSA means that you subscribe to the farm for the growing season and Kelly and Jeff deliver fresh produce to a location near you every week. The produce you receive every week depends on what is in season so you get a chance to discover all kinds of new vegetables that you never knew existed. Three Sisters Farm is unique because they actually allow you to pick some of the vegetables that go into your box each week on their website. So you if you're looking for volunteer opportunities, a CSA to join or just two genuinely welcoming farmers to talk to, look up Jeff and Kelly. Mobcraft Brewery brings a new business model to small breweries: crowd sourcing. Anyone can go on their website to submit an idea or recipe for a beer. Every month, the top ideas go on to the website and anyone can vote for their favorite by pre-ordering their choice. The voting closes after a month and the brew master Andrew Gierczak perfects the recipe. Mobcraft has a new beer featured every month that is chosen by their customers. Once the new building opened in Milwaukee last year, I met with the founder Henry Schwartz to photograph the brewery. It is a large beautiful building with top-of-line brewing equipment, but the brewery didn't start this way. Before Mobcraft was even a business, it started as a few friends home brewing in Madison. They would brew beers based on requests from their friends. They soon realized that this would be a great idea for a business and officially started the company in 2012.